Will Trigger an AR Experience! CULVER CITY, Calif. (February 9, 2018) – Experience this year’s biggest and best family fun adventure starring some of Hollywood’s most popular actors when JUMANJI: WELCOME TO THE JUNGLE debuts on digital March 6 and on 4K Ultra HD™/Blu-ray™, Blu-ray and DVD March 20 from Sony Pictures Home Entertainment. In addition, the physical skus will also include digital versions of the movie, redeemable via the all-new Movies Anywhere App. Explore the vast and exciting world of Jumanjiwith Dwayne Johnson (Fast and the Furious franchise), Jack Black (Goosebumps), Kevin Hart (Ride Along) and Karen Gillan (Guardians of the Galaxy franchise) as they work together to beat the mysterious game they were drawn into so they can return to the real world. JUMANJI: WELCOME TO THE JUNGLE also stars Nick Jonas (“Scream Queens”) and Bobby Cannavale (Ant-Man). Now fans can experience what it’s like to be transported into the world of JUMANJI: WELCOME TO THE JUNGLE. For the first time ever, the home entertainment packaging will feature a Snapchat Snapcode that unlocks an augmented reality experience. When fans pick up a copy of the film on Blu-ray or DVD at any retailer and scan the Snapcode with their Snapchat app, they will find the jungle brought to life right in front of them. Once there, they can record their experience and share it with their friends. There will be an additional Snapcode on an insert inside the package, exclusively for consumers who purchase the disc, that will trigger a second first-of-its-kind AR experience that will bring the characters from Jumanji into your living room. 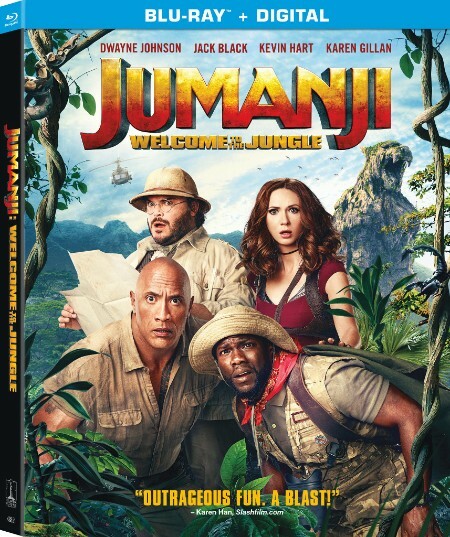 With the Digital, Blu-ray and DVD releases of JUMANJI: WELCOME TO THE JUNGLE, fans can delve even deeper into Jumanji with the amazing bonus materials packed with more laughs, more action and more fun, including a hilarious gag reel, a music video and three behind-the-scenes featurettes. Prepare to be rocked when Jack Black and Nick Jonas share their mind-blowing take on an original theme song for the film in the epic music video “Jumanji Jumanji.” Fans can follow the intrepid guide, Nigel, as he leads them through a behind-the-scenes journey showcasing how this epic adventure came to life in “Journey Through The Jungle: The Making of Jumanji.” In “Meet the Players: A Heroic Cast,” Dwayne Johnson, Kevin Hart, Jack Black and Karen Gillan discuss the fun they had diving into character and working with each other. Fans will also hear from the team of talented visual effects artists on how they created one of the film’s most exciting scenes in “Attack of the Rhinos!” The Blu-ray and digital releases contain two additional exclusive featurettes, including “Surviving the Jungle: Spectacular Stunts!” a firsthand look of how the most eye-popping stunts were conceived and executed. “Book to Board Game to Big Screen & Beyond! Celebrating The Legacy of Jumanji” is a loving and nostalgic look at the enduring legacy of Jumanji as the cast and filmmakers reflect on the beloved original 1995 film and how the new film honors the original’s exciting history. Based on the book by Chris Van Allsburg, JUMANJI: WELCOME TO THE JUNGLE was directed by Jake Kasdan from a screen story by Chris McKenna and screenplay by Chris McKenna & Erik Sommers and Scott Rosenberg & Jeff Pinkner. The film was produced by Matt Tolmach and William Teitler and executive produced by David Householter, Jake Kasdan, Dwayne Johnson, Dany Garcia, Ted Field and Mike Weber. JUMANJI: WELCOME TO THE JUNGLE has a run time of approximately 112 minutes and is rated PG-13 for adventure action, suggestive content and some language. Sony Pictures Home Entertainment (SPHE) is a Sony Pictures Entertainment (SPE) company. SPE is a subsidiary of Sony Entertainment Inc., which is a subsidiary of Tokyo-based Sony Corporation. SPE’s global operations encompass motion picture production, acquisition, and distribution; television production, acquisition, and distribution; television networks; digital content creation and distribution; operation of studio facilities; and development of new entertainment products, services and technologies. SPE’s Motion Picture Group includes film labels Columbia Pictures, Screen Gems, TriStar Pictures, Sony Pictures Animation, and Sony Pictures Classics. For additional information, visithttp://www.sonypictures.com.